Here´s the first set of a pair work I´ve made with caricatures of famous people or characters. 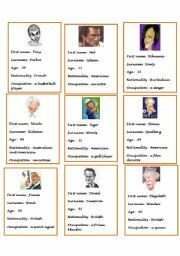 Students revise names, age, nationality, occupation pretending being a famous person. 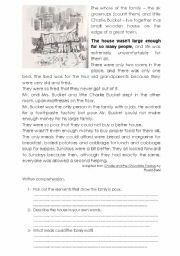 Description of Charlie´s poor family and Charlie´s house. 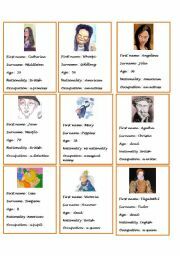 This the second set of cards that will enable students to revise names, ages, nationalities . And a little bit of culture. This is the third set of cards. The first set was loaded yesterday. 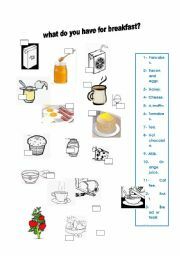 This is a matching exercise, hope it´s useful. 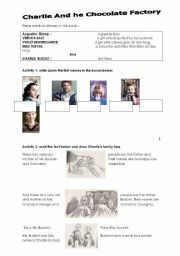 This is the first part of a work on CHARLIE AND THE CHOCOLATE FACTORY The students discover the characters first through the beginning of the book by Roald Dahl and have 3 activities. 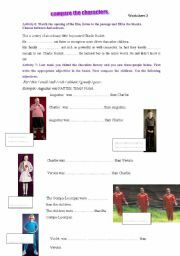 This is the third part of the study of the film Charlie And The Chocolate Factory. 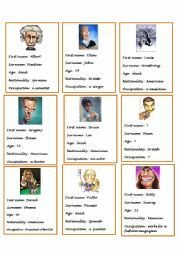 It mainly focuses on the comparison of the children, using such adjectives as fat, thin, samall, tall,etc and on the use of was/were. A few exercises on colours. 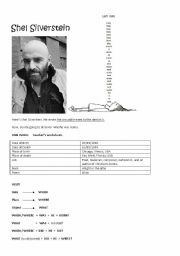 After studying the video THE CROCODILE WENT TO THE DENTIST´S, my students discovered more in details who Shel Silverstein was. Here´s a pairwork on Silverstein´s biography and a poem I´ve asked my stuedents to learn.